My First Sentence Pack Is Here! Huzzah! Verily! It is here! “My [or, I guess, your] First Sentence Pack”. 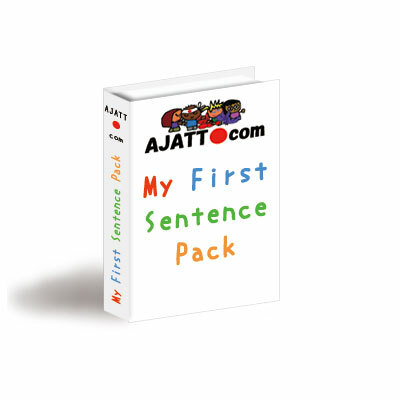 A set of over 500 short, fun, easy, useful example sentences to get you started with the so-called “AJATT Method” of learning Japanese. You REALLY Don’t Need This. No, Really. Also, Japanese literature of all forms is produced in massive quantities. The Japanese language was the first in the world in which a novel was written. The top FIVE highest-circulation newspapers on the planet (including the only newspapers with circulations exceeding 10 million copies) are all published in Japan, in Japanese — not the US, not the China, not the India, but the Japan. Japanese is also the language with the most blogs — more than English, even. There is no shortage of “Japanese sentences” in the world, out there, for free, even. So Why Would Anyone Even Want This? For the same reason people would want the QRG. Because, when you’re first starting out, things are daunting; things are confusing; everything is new. There’s a lot on one’s proverbial plate. One less thing to worry about can make things just that much quicker and easier. The key words here are ease, convenience and, to quote a Simpsons episode, “can’t somebody else do it?”. Sure, you could go find all your first X hundred sentences yourself, but if the feeling is right and none of the major religions of the world have a problem with it (?) then…you know…one or two sentence packs here or there never killed anyone…hopefully…probably. Somebody else can do it, my friend. And he already has. Just for you. 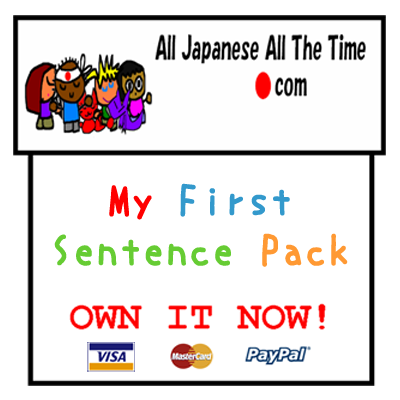 “My First Sentence Pack” (I am desperately resisting the urge to call it MFSP…must stop…creating…acronyms) comes as a special, permanent, online-delivered, digital, learner-friendly, infinitely copy-pastable book containing more than 560 Japanese sentences, with English translations and brief explanations where necessary; it is constantly cleaned, corrected and updated, always giving you the latest, greatest version. Check out this sample page. Being in electronic format makes the sentence pack ideal, because you’re saved all that slow typing. Those who know, know that what really kills about typing isn’t the actual sentence, but all the ancillary info that goes along with it. Not to mention the increased risk of error. Until now, beginners have mostly had to rely on beginner books (as I did), which are, well, books, on paper. Now all you need do to get your sentences is copy and paste. The idea here is to bridge the gap between “0” and “independently using native [electronic] media sources, such as blogs”. 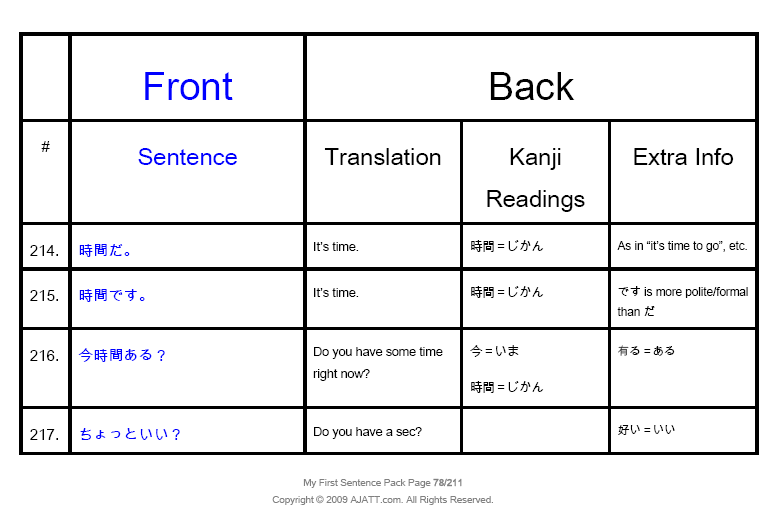 Each example sentence is made up of two basic parts: “front” and “back”, just like actual paper flashcards. The front carries the sentence, the back its translation, kanji readings and any extra info if applicable. While this sentence pack is and will be useful and has been made with the best of intentions, please remember that it is not a substitute for exposure to real Japanese. That is, Japanese made by and for native users. These sentences have been written/chosen as good representatives of fun, simple natural usage. They steer clear of a lot of the sleep-inducing, hyper-didactic, unnaturally anglicized stuff [case in point: incessant pronoun use] that seems to be common in Japanese beginner materials. However, they (1) by no means represent “everything you will ever need to know”, (2) are slightly biased towards things that are easy to translate into/explain in English, and (3) were selected for an audience of non-Japanese speakers (not that you’re not Japanese, but… 🙂 ) — at some subtle level, this “contaminates” them. Fundamentally, the Japanese you want is the Japanese that Japanese people get, not the Japanese that someone, even a handsome, charming, well-meaning someone, prepared and selected for you. In other words: these sentences are like training wheels — use them, but you want to ride the bike for real as soon as you can. That’s where all the fun is, and it’s where the bulk of your learning, both in terms of time and quantity, will take place. In any case, Japanese is full of things that are hard to translate/explain, or seem complex when explained, but that are super easy to understand when you just expose yourself to the language as it is. So, to conclude, keep being Japanese, keep experiencing more Japanese, and things will get clearer and clearer. Thank you again, and have fun! Buy It Now, Baby 😉 ! You know the drill: All that’s left to do is click. Your copy is waiting for you. Buy it now. Do it. You need this. You want this. You deserve this. You’re worth it. Treat yourself. Those aren’t blemishes on your face, they’re beauty spots. Et cetera. 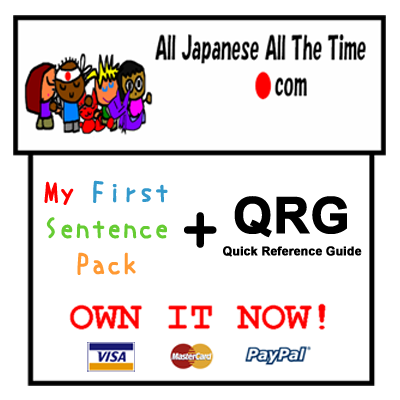 You can get your My First Sentence Pack either by itself or value-bundled together with the QRG/Quick Reference Guide. Choose whichever path suits you best. I’m open-minded like that. All 100% DRM-free. No DRM whatsoever: I hate DRM. I trust you. You’re a good person. I know you’re not going to screw me over. I believe you should and must have the right to remix (copy and paste, etc.) information for your personal, educational use. I believe that information is for fiddling with, not just looking at. I believe that you, a paying customer, should and must not be treated like a freaking criminal and subjected to ludicrous, draconian restrictions on how you manipulate data you paid for for you own consumption. MFSP is easy to copy and paste and otherwise manipulate digitally for your personal, educational use, so that you can get the maximum possible value out of it. Buy it. Try it. No likey? No payey. If you are less than happy with the MFSP, don’t sit there feeling bad 🙁 , just contact me for a full refund. More AJATT products are always on their way, so in the exceeeeedingly unlikely event that you don’t like this one, I’m sure there’ll eventually be something you do like. Until then, take a refund 🙂 . W00T first comment and I’m not even learning Japanese! But I will get this when I start learning it in the future. I’m seriously considering buying it… How about some samples, so we have an idea what we’re getting into? In the example page I see in the extra info column that ある and いい can apparently also be written as 有る and 好い. Does anyone know (a good link to) the reason why they aren’t written in the kanji form? Or is the choice between writing those words in hiragana/kanji something that one day will (have to) come naturally? Perfect timing! I’m at 1980 kanji and I’ll be starting sentences early next week, AND I’m incredibly bogged down with college. I really, really don’t want to use this, but the “this cheapens your ownage, you know” voice is being suppressed by the “I actually want to HAVE ownage” chorus that sings back. This kind of effortless* kick start is exactly what I needed. Thanks, Khatsumoto! *Effortless collection, anyway. Learning this, not so effortless, eh? Awesome! I’m almost done with RTK 1 and this is perfect! I’m guessing they are written in hiragana more often than kanji because they are so common. Not bad i was thinking of getting this i’m currently at 780 sentences. I must say my reading ability is improving/listening at a short amount of time. I’ve managed to do all my reps for kanji/kana/sentences daily. Although i don’t write everything i see but just the ones that i haven”t written in a while. My writing is decent but not prefect yet. I was reading in you’re post you won’t really need anything more then 10,000 sentences to get a high level of proficiency. So that intrigues me cuz since i like the method i might go to 20,000 LOL well maybe being realistic maybe around 15,000 would be possible. Anyhow anyone doing this method keep at it and you’ll get fluent in no time. 1.5 years estimating although depends on how much you give it daily. Could be 1 year. I love the thought of copy and pasting my way to greatness. Thought it would be a great way to start me out for sentences so I Had to buy it. Whaaaa? That’s what it says in this article. same with what Isaac said, a lot of the commonly used words or expressions, even though they have Kanji forms, are not written in Kanji. Arigatou Gozaimasu can be written as 有り難う御座います, but I hardly ever see that, or more like never. Some verbs which have really tough Kanji in them (perhaps not part of the Jouyou set), are written Kanji-less as well. Damn can’t think of any right now. But yeah. Also, something like dekiru or koto might not always come up as 出來る or 事.
just purchased the double-trouble-package! Being in month 6 of the grand journey I thought I was far from being in any need of this. But I was waiting all the time to make a donation. And now I was able to donate some pennies and even got a present for this. How great is that ^^ . I guess these must be also the sentences Khatz accumulated in the first place, but I’m wondering how he figured out that explanation??? I’ve actually seen いい written with kanji quite often, but not 好い. That actually confused me when I looked at the sample page; I didn’t realized you could use that kanji, because I’m used to seeing it as 良い. But, where I tend to see this is on a certain blog, so maybe it’s just individual preference? I really don’t need this. ^^ No seriously. I am hovering around the intermediate level in my Japanese — I can’t really hold a conversation all that well, but I can handle myself in basic situations — and I have about 5000 cards in Anki, but I was super curious to see what sentences Khatz would give us and what exactly he included on each card. And seriously.. I spend more than this in the konbini everyday, so the money is no prob, and Khatz has more than earned it with all the free content he’s given us over the years. I’ve only skimmed a few pages so far, but looks good! Already I see phrases I don’t know. Its super special awesome (etc). I quite like the Sentence Pack, great choice of sentences, really helpful for someone like me who’s had some exposure but very limited knowledge of the language…yet! I’m not particularly comfortable with the size of the table, though. The head of the table is just huge, so there a too few sentences per page, and it’s not pretty either. Still, much better than relying on “Watashi wa Sumisu desu.” books or having to look for suitable, manageable sentences yourself as a beginner who has trouble with all-Japanese reading material. Also check packs 2, 3, 4, and 5, in separate articles. In total about 50 items. It’s 糞 brilliant. Khatz undersells his usefulness on this one. There are lots of useful phrases that you won’t find in any beginner textbook in here. His comments and extra info are excellent and humorous as well. I’m super busy right now, but I’ll do a review today or tomorrow. love the sentences… but can we get an SRS-importable version? feel like it might take forever to import them. yes, I’m lazy. My only criticism is that a different format would have been preferable so that it could easily be imported into anki (I assume that most people use anki also). It can be very time consuming to add cards individually even with copy/pasting. Perhaps you could make decks in various SRS formats and bundle them with the PDF? Don’t remember the last time I laughed this hard. AJATT FTW. That’s obviously a joke. No one is that stupid. Cheers again to Khatz for being awesome. I was wondering if you could perhaps talk a bit about traditional vs. “modern” kanji in Japan nowadays? I know you’re in favour of the traditional, so you’re definitely not a neutral/unbiased source, but I’m interesting in hearing (reading) what you have to say (write) about them. Is it practical to learn them, and if so, to what extent? I’ve only seen modern/simplified kanji in print, so I’m guessing that learning those is more important. That said, if I choose to learn the traditional, will I be able to recognize modern kanji when I see them? Should I perhaps learn both? Also, do young people (say, people 40 and under) still sometimes use traditional kanji in their handwriting? Are the old characters still lingering over Japan, or are they really fading for good? @Maya I’m not Khatz, but I’ll chime in anyway 🙂 Traditional Kanji (I assume you’re talking about the ways to say 有り難う instead of ありがとう　or 御飯　ご飯) are still used everywhere. Many of the traditional Kanji are all over official documents and signs, such as: 御注意下さい so they’re definitely understood and read by everyone. Normal people? As far as I have noticed, when handwriting, they use fast kanji like 木 or 目 often and and lots of ひらがな. If it takes longer to write out the 漢字, even sloppily, it won’t be used much. When typing, much more 漢字 will be used. Politeness level sometimes does come into play here as well (if you’re handwriting a note to your boss or your friend, it will be quite different). So it really depends on the context. For the most part, the Japanese absolutely know their Kanji. It’s their language. They can read it. They know how to write it, but often don’t. yeah, that helps 🙂 I was mostly wondering about older forms of kanji – I didn’t doubt that the Japanese were fully literate in modern/regular kanji. Thank you!!! Have just purchased =D. Pingback: All Japanese All The Time Dot Com: How to learn Japanese. On your own, having fun and to fluency. » QRG Version 1.0 Is Here! I got my copy and my money is now heading for your face. You might want to keep it armored until it arrives.